Ourworld is full of risk at every turn—from perilous jobs to dangerous drivingconditions. That’s why we all love to get back to our homes and not worry abouteveryday safety hazards. It’s great to feel comfortable and safe at home, butis it as safe as it can be? Yourhome should be your haven: the place where you will be protected from harm. Itshould be a top priority, and yet every year 12,000 people or more visit the emergency room during theholiday months due to accidents and unintended injuries sustainedfrom hidden dangers around the home. Witha sharp eye and preventive action you can reduce the chances of lurking safetydangers for everyone who visits your home. 1. GOOD LIGHTING— Adequate lighting reduces therisk of tripping and falling both inside and outside your home. This isespecially important in winters when days are shorter. Critical areas that needto be illuminated are the stairs, outdoors, and foyers. Make sure your streetnumber is well lit and visible from the street to aid first responders findyour home. The fix: Make sureadequate wattage is utilized and long-life bulbs and motion detectors are inplace. 2. ELECTRICAL PROBLEMS?— Electrical issues, like a flickeringlight or a dead outlet, can be mild annoyances that actually signal seriousdangers. If not addressed promptly, a faulty electrical system can result inhouse fires and shocks. The fix: Ifyou’re experiencing any problems with your electricity, contact a professionalright away. In your daily life, make sure electrical cords are not frayed orpierced and extension cords are securely connected. Do not run too many cordsto a single outlet. Unplug small appliances, space heaters, and power toolswhen not in use. 3. DO ROUTINECLEANING— Not maintaining your appliances leads to a greater chance of accidentalhome fires. The fix: Do simple tasksregularly like cleaning grease off your stovetop, emptying the lint trap onyour dryer, and keeping your chimney clean and clear. 4. SMOKE AND GAS DETECTORS— Every home needs functional warningdevices that detect smoke and gases. Thefix: When purchasing smoke alarms, make sure they also detect carbonmonoxide, a deadly gas that is especially dangerous because it is colorless andodorless. Replace the batteries every six months—or whenever you change yourclocks. Create an emergency evacuation plan, build a preparedness kit, andpractice regularsafety drills with your family to ensureawareness of procedures. 5. SECURE YOUR HOME— Many homes now have the latesttechnological advancements but still rely on locks and hardware from decadesago to keep you safe from intruders. Thefix: Do an audit of all entry points to your home—doors and windows andscreens. If any do not have secure screens, locks, and deadbolts, have theminstalled. For those entry points that do already have door knobs, handles, andlocks, make sure that they are in good working condition. 6. WHEN YOU ARE AWAY— We all enjoy long weekends andout-of-town vacations, but unfortunately that leaves your home vulnerable tointruders. The fix: Create theillusion that someone may still be there. Leave a TV or stereo on in the roomwhere a burglar would most likely break in. Have neighbor pick up mail and thedaily paper. Turn down phone ringers, keep blinds drawn, and don’t leaveunsecured valuables in the home even if you think they are well-hidden. Neverhide keys around the home or garden, and don’t leave notes on the door thatsuggest you are out of town. 7. HOUSEHOLD REPAIRS— Even if you are an expert and knowyour way around electrical, plumbing, car or other household repairs, proceedwith caution. A poor repair could be a recipe for disaster. The fix: Call a professional or ask mefor a referral from our trusted sources. 8. VEHICLE CAUTION—Remember that there is danger even beforeyou drive on the street. If you are backing your car up, watch out for childrenand pets on the sidewalk and road. Thefix: Be cautious and proceed slowly when driving vehicles in or out of yourdriveway. If your driveway does not have good visibility in both directions,walk down and look in both directions before you get in your car. 9. MAKE IT SAFE FOR VISITORS— If you are hostingfriends and family, consider what additional safety challenges they may face. The fix: Put yourself in the shoes of asmall child and look for low, hard edges, sharp objects, easy-to-open cabinetswith chemicals and cleaning agents. Look for falling and tripping hazards thatmay fell seniors. 10. BRACE YOURSELF— Heavyobjects are rarely braced in the home. Appliances, artwork, televisions, andaquariums present real hazards if they are knocked down by a person or anatural disaster. The fix: Strap andbrace heavy objects and use security hardware for large artwork. 11. UNCOVER HIDDEN DANGERS— If your home was built before thelate seventies, there’s likely lead in the paint under the top coats on yourwalls and windows, and there might be traces in the varnish used on manyhardwood floors. In addition, asbestos often can be found in insulation and“popcorn” ceiling textures. The fix:Hire a licensed contractor to test for possible contaminants and remove themsafely, especially prior to a remodel. 12. MOTHER NATURE— Yourhomeowners insurance will cover you in many instances, but did you know thatyou may not be insured against natural disasters like earthquakes, floods,tornadoes, and hurricanes? They typically require an additional policy. The fix: Contact your insurance agentto make sure you have adequate replacement coverage as home values escalate andcoverage amounts can stay static. Discuss costs for adding disaster policiesfor the natural disaster most likely to hit your area. Finally, having adisaster and communication plan can minimize the risks. Doyou have small children who live with you? Even if you don’t, with the holidayseason rapidly approaching, your home may welcome friends with young childrenand older family members. This makes now the ideal time to survey home yourhome for potential safety problems. Didyou know that as little as an inch of water can be a major hazard? A pail ofwater in the yard, large puddles from a storm, even a washing machine caninduce a small child to trip or fall into and become at risk. The fix: Watch for open ice chests andother standing water, and don’t leave toilet seats open. Button-sizedlithium batteries power small electronic devices, including remote controls,watches, musical greeting cards, and ornaments. When accidently swallowed, theycan get stuck in the esophagus and generate an electrical current that cancause severe chemical burns and tissue damage. The fix: Only let small children play with mechnical devices andtoys under supervision, and make sure to put these items away when not in use. Everyyear, more than 5,000 kids end up in the emergencyroom after tumbling out of a window. Combat that by installing window guards orwindow stops so kids can’t fall out. Stairs are another potential hazard foryoungsters with less-than-perfect balance. Thefix: Baby gates can prevent young kids from venturing up or down. Stepsshould always have firm footing and be clear of objects as even older peoplecan slip and fall or trip on items left on the stairs. Catscan scratch a child not used to playing with finicky felines. The family dogmay be big and loving but can outweigh a child by five times. Children can beeasily knocked down, nipped, or even bitten by a dog not used to the activityof small children. The fix: Monitorplay activity and make sure your pet is not getting anxious or annoyed. Babiescan be strangled by cords on blinds and shades. The fix: Excessive cords of all types should be removed or secureddown. Always keep cribs away from windows with loose cords. 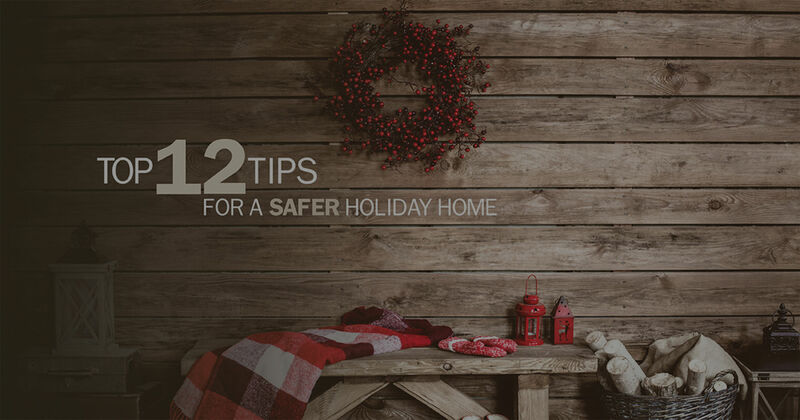 Withthe upcoming holidays at hand, now is the perfect time to survey your home andaddress potential safety hazards to yourselves, your family, and your friends.It doesn’t take long, most fixes are very inexpensive and simple to do, andyour efforts will pay dividends in peace of mind for years to come. Ifyou would like our advice on how to make your home safer and need a list oftrusted sources for home repairs, please contact us today. It’s our business toensure that your home is safe and secure for your family.